Looking for a small cottage to turn into your own beautiful home? 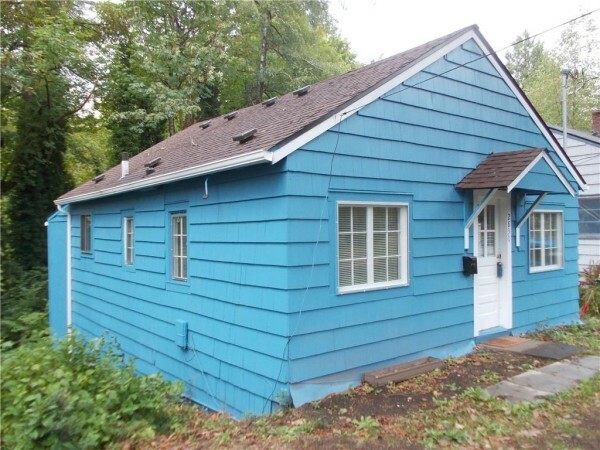 Check out this 748 square foot home in Olympia, Washington that’s for sale. Outside, you’ll notice a simple rectangular home with bright blue shingles and white trim. When you go inside, you’ll find crisp white walls and beige carpeting just asking for residents to transform it into “home sweet home.” It includes one bedroom, one bath, a nice kitchen with new vinyl floors and an oven, and an unfinished basement with more square-footage potential. The home includes double-pane windows, cable potential, and a quiet neighborhood. The asking price is just about $130,000. Without a staging, it looks like one room after another with white walls and you have to figure out which room is which. It would be nice in situations like this if an actual floor plan was included with some measurements and fewer similar pictures of the outside. A lot of these off of ZILLOW are listed prior to foreclosure and you are lucky to even get interior shots; if you go to the site sometimes you can contact the Realtor and get plans. You are not buying it from this site! This is adorable and not that hard to puzzle out; would love it! Interesting little place. It probably started out as a cabin and so is a bit primitive. From the photos it looks like some upgrades are needed (ceilings, floors). I would also be concerned with water issues because the siding is just so low to the ground. All in all, it might appeal to someone looking for a small place with land.